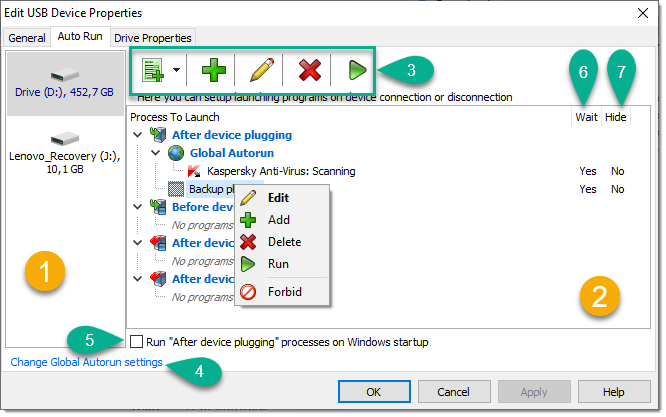 USB Safely Remove Help - How to use program autorun? Help > How to use program autorun? 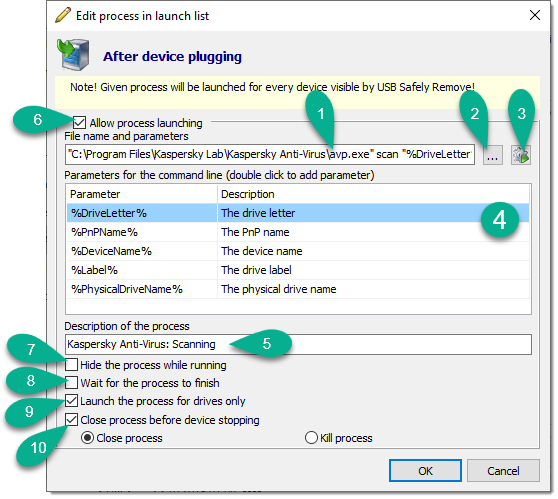 Autorun feature allows to setup program launching not only for a specific device but for all hot-plug devices visible by USB Safely Remove. Thus we can distinguish two kinds of autorun settings: so-called "Local" Autorun and "Global" Autorun. Find more information about autorun options and how to set it up below. Link to global autorun settings. Proceed this link if you want to setup launching of programs not for given device, but for all visible devices in USB Safely Remove. Also you can access global autorun settings by double-clicking to global autorun process line or via main menu -> Options -> "Global Autorun" tab. Wait for the process to finish. This option can be set up in the adding/editing process command line window. If it is checked, USB Safely Remove will wait until this process finishes and only then it runs next process in the section. If this option is unchecked, USB Safely Remove will run this process and immediately proceed to the next process. It is checked by default. 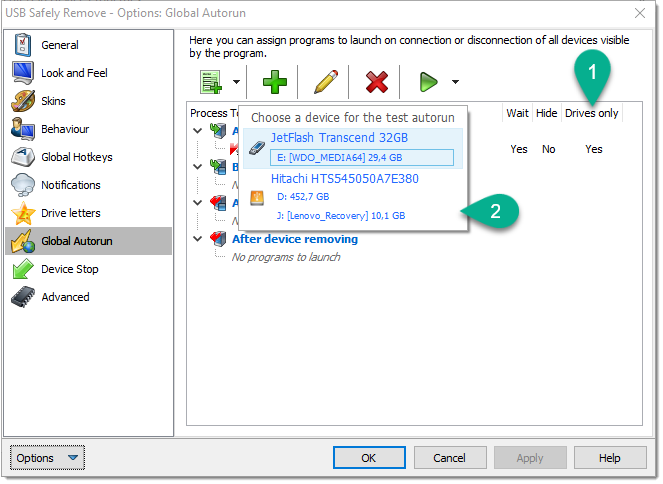 Global autorun settings are applied to all hot-plug devices visible by USB Safely Remove. It means that if you add an application into "Launch process after device connection" it will be launched on connection of any hot-plug device. %DeviceName% - device name. It is a name device how you can see it in USB Safely Remove. Initially it is an internal name given by a device manufacturer, however you can change it in device properties so a changed name will be passed to the called application as %DeviceName% parameter. Wait for the process to finish. If it is checked, USB Safely Remove will wait until this process finishes and only then it runs next process in the section. If this option is unchecked, USB Safely Remove will run this process and immediately proceed to the next process. It is checked by default. For your convenience we have included into USB Safely Remove command lines of many popular applications. This great ability enables you to set up automatic scanning of your external drive with your antivirus program, mounting\dismounting flash drive-based TrueCrypt volume and many other things. To choose one of the predefined autorun templates just click " Add predefined autorun template" button.